Hakurei Reimu as she appeared in the first five Touhou games for the PC-98 system. 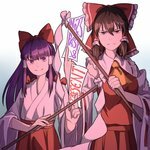 "Classic" Reimu is usually distinguished by purple hair and a more traditional miko outfit; she may also look a bit younger. The kanji in her name is a bit different from the Windows version (靈 <-> 霊). Despite this, she is not generally considered to be a separate character from the "Windows era" Reimu. The following tags are aliased to this tag: classic_hakurei_reimu, hakurei_reimu_(classic) (learn more). This tag implicates hakurei_reimu (learn more).